So it’s been a busy couple of days if you’re a Columbus Crew fan. It all started on Monday afternoon, when it was tweeted, facebooked, etc., etc., that the Columbus Crew had a big announcement to make Tuesday. Now, that could have meant a number of things. But the fact that Hunt Sports Group Chairman Clark Hunt and Crew President and General Manager Mark McCullers were to be present to make this big announcement, it was going to be a pretty big change. Or at least that’s the illusion that was given. Most Crew fans were hoping for a change in the coaching staff, more specifically that head coach Robert Warzycha would be handed his marching orders and a new coach would come in to salvage playoff hopes. It became evident as the day went on, however, that would not be the case. Even though the team’s Tuesday practice would be closed to the media (something practically unheard of ), there had been no mention of Warzycha and the inside track was the announcement had to do with the investment side. Not too disappointing as the need for new owners has also been an outcry from some fans over the past few seasons. And that’s exactly what we would get. Hunt announced during the conference that full ownership of the Crew team and stadium would be passed on to Precourt Sports Ventures, headed up by Anthony Precourt. Doesn’t sound too huge to you? Well for Crew fans, it’s pretty big news for us. The Hunt family has owned the operating rights to Columbus since the team’s beginnings in 1996. They built the first soccer-specific stadium in the league. They’ve done a lot for the game and the league. I mean, heard of the Lamar Hunt Open Cup? Named after the man that started the Crew. But in regards to Columbus, if you haven’t noticed, the past couple seasons haven’t exactly been all rainbows and sunshine. Change and fresh perspective can some times be exactly what a team and brand needs. Sporting Kansas City is a great example. This new Columbus owner could be just the start of such a rebrand for the Crew. Precourt is young and seems very ambitious to get his feet wet in MLS. According to the press release on the Crew’s website, Precourt has been the managing partner at Precourt Capital Management since 2008. He helped form Precourt Sports Ventures, LLC in 2012 “as part of a diversification strategy into sports-entertainment; specifically soccer.” So in that regard, we’re hoping he’ll bring money. But that’s not all Crew fans are wishing Precourt will bring to the Midwest team. He often mentioned in the press conference how he was excited to connect with fans, ready to take a look at the team and implement needed changes. Most importantly for those who follow the Crew, he frequently mentioned that the team needs to win. And when I say frequent, I’m not kidding here folks. He made it a point to continue to say winning needs to start happening and I got the impression that the current losing streak is Precourt’s top concern. And while he said things in the coaching staff will stay as is … to me it seemed he was also saying it could change in the near future. He said he’s going to leave the soccer to the coaching staff, but he also said he isn’t going to be an “absentee” owner. I like that mentality too, where an owner can recognize he isn’t a coach, but also realizes that sometimes you got to get in there and make decisions to better the club. 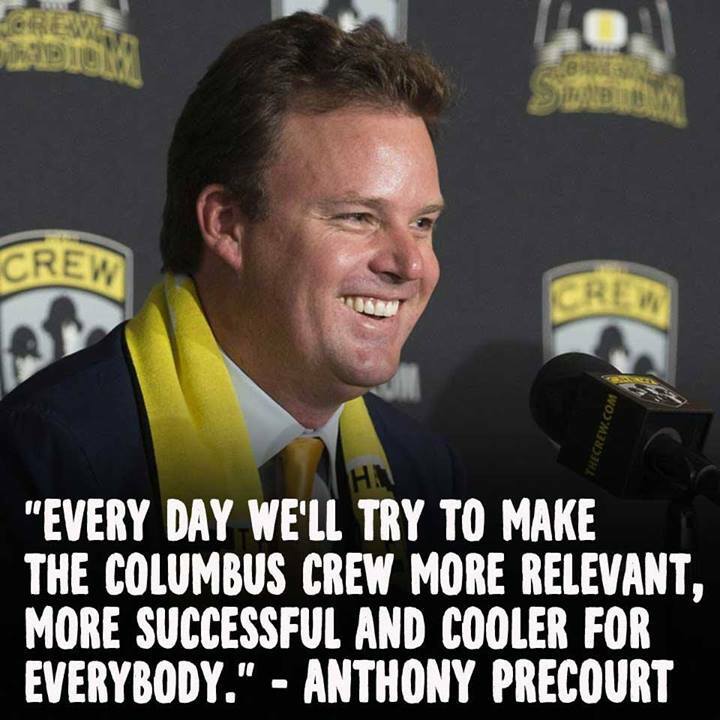 For my part, I liked how Precourt seemed very earnest about making the team better and raising the bar; making Columbus a “gem” of Major League Soccer as he put it. That’s an awesome way to put it and really speaks to the fans, as I often feel the Crew are pushed to the side or deemed one of the lower clubs in the league. I love Columbus, I love the Crew. I think all this team needs is a little care and to start winning. It’s a soccer town waiting to explode, but needs the right encouragement. Precourt could be just what gets the ball rolling, so to speak. I also felt a little better when he assured the media that the Crew would not be moving out of Columbus. That was definitely something I feared. But it seems that – for now – Precourt recognizes that this team needs to stay in Columbus and that it can work. All in all, this is exciting. I don’t think it was the news many of us were looking for, but to me it is a start. As mentioned before, the Crew have been struggling quite a bit this season; it’s been a down-hill slide for them as the season goes on and with each game they don’t win, the playoffs slip further and further away. I’ve mentioned this above and others have brought it up as well, but Sporting KC’s rebrand a few years ago started with a new owner with new ideas. Now they are one of the top teams in the league with a great stadium and fan base. Kansas City really has become a soccer town. I’m crossing my fingers that Precourt will do the same. While the Hunts gave us a lot, we need to move forward. Change is good.